XML to JSON, XML, CSV, PDF via command line. Total XML ConverterX converts XML to CSV, JSON, PDF via command line. It is a unique web-server solution to turn your XML files into other file types. Total XML ConverterX processes any number of XML file in batches and strictly keeps the folder structure. Total XML ConverterX has no GUI, no interrupting messages. The errors are saved to a log file. You can run it on a web-server or even implement into your own application (ActiveX and sample code files are provided). Convert XML files and copy original time stamps to keep files organized. Total XML ConverterX supports very sophisticated XML documents and always provides great results. If you are looking for a command line XML converter, look no further. 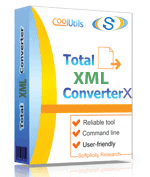 Total XML ConverterX will help you to format your XML files or facilitate data-interchange between systems. Backed by almost 10-year experience in all kind of converters, CoolUtils guarantees the quality of the product. Download the free evaluation copy now and test it for 30 days. 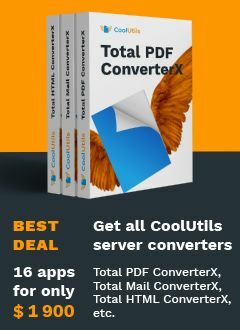 "Total XML ConverterX seems to be perfect perfect for my use, though we use it only to convert old .xml files to other formats." "We chose the program for the ability to process XSLT files. We had over 6,000 XMLS and the converter did the job in less than an hour! Thank you!"